Ground cherries (Physalis pruinosa) are not a very well known fruit, but they are easy to grow in your garden. These small, yellow berries have a sweet-tart flavor that is similar to pineapple with a very faint background flavor of the tomato. Ground cherries, also known as the cape gooseberry and husk tomato, are grown as annuals in areas that experience winter freezes. If you want to grow more fruit in your garden but don't have the space for trees or large brambles, ground cherries may be just the thing. Ground cherries grow well in any area that has a relatively long growing season, particularly in USDA zones 4 and higher. The plant is not overly picky about soil, but well-draining soil amended with compost is ideal. You can grow ground cherries in a traditional bed, raised beds, and containers. Just make sure any container is at least 8 inches deep to allow for the plant's fairly large root system. Full sun is preferable, but ground cherries produce fruit with a bit of shade as well. Ground cherries should be started from seeds indoors, six to eight weeks before the last spring frost date in your area. They can be started in cell packs or soil blocks. Ground cherries may be slow to germinate, but be patient. Once they get going, they grow steadily until it's time to harden them off. Plant the ground cherries 18 to 24 inches apart after the danger of frost has passed. You can bury the stems as you would with tomatoes, but this is rarely necessary; ground cherry seedlings tend to be compact and bushy rather than overly tall. They do not need to be staked or caged. As ground cherries grow, they grow wide rather than tall. Expect ground cherry plants to grow about 2 feet tall and 2 feet wide. If you don't want them to sprawl, use the smallest tomato cages you can find to support them and prevent them from spreading. Ground cherries are ridiculously easy to grow. All you need to do is make sure they get at least one inch of water every week. Dry conditions cause them to drop their blossoms without producing fruit. 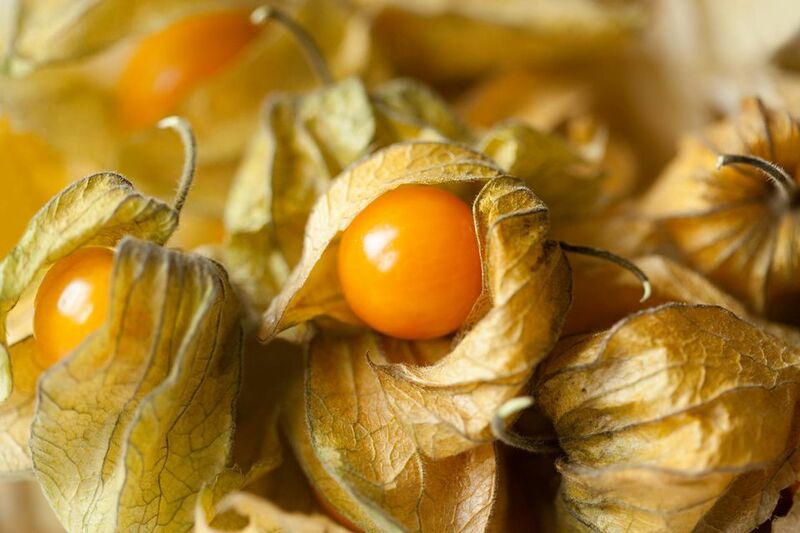 Ground cherries produce berries in husks, much like their relatives, tomatillos. When the husks turn brown and papery, the berries are ready to harvest. Often, they drop off the plant when they're ready. You can harvest them from the ground around the plants, hence the name, ground cherries. After you remove the husks, you can pop them in your mouth, freeze them, or chop them up for inclusion in salsa, chutney, pancakes, and salads. If you live in a short season area and frost threatens before the ground cherries ripen, cover the plants with a floating row cover or bed sheet to buy a few degrees of protection until they ripen. Each plant produces about one pint of berries throughout the growing season. Try to pick up fallen fruit often. If left on the ground, it breaks down, and you'll have ground cherry seedlings popping up everywhere. This isn't necessarily a bad thing, but it is something to keep in mind. Mulch with straw or grass clippings around the plants. Not only does it maintain adequate soil moisture, but it makes the fallen fruit easier to spot. Ground cherries are usually not bothered by pests and diseases. You may have problems with cutworms when you first plant the seedlings into the garden. The best organic way to protect young plants from cutworms is to place a paper or cardboard collar around the seedlings and transplants. Press the collars down into the soil an inch or so to secure them. The most commonly available variety of ground cherry is the ubiquitous "Aunt Molly's" ground cherry. It is available in most seed catalogs and is sometimes found in nurseries. Other varieties include "Cossack Pineapple" and "Goldie."